My parents recently took a trip to Istanbul. They fell in love with the city–the architecture, the sweeping water views, the riotous mingling of cultures in the streets. And they absolutely raved about the food. One of the first things my mother did when they got back was find a recipe for one of their favorite dishes they had in Turkey: lentil soup. 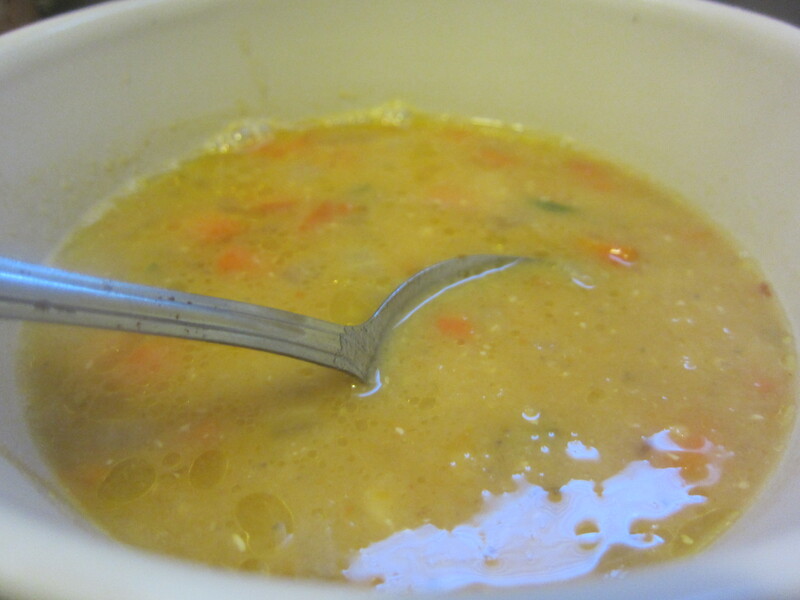 Normally, lentil soup is hearty, rich, winter-warming fare. The Turkish version is a cool-summer-night kind of soup: light, brothy, lemony and soft. The base here is red lentils, which are smaller and more delicate than most other kinds. When cooked, they fall apart almost completely–a disaster for salads, but ideal for soups. And unlike garden-variety green or brown lentils, red lentils turn a sunny golden color when cooked, turning a murky bottomless stew into something bright and almost refreshing. The original recipe my mom uses is about as simple as it gets: dump all ingredients into a soup pot and simmer until cooked. The result is a simple, lighter-than-air soup, but I found I wanted a little more depth and complexity. I added back in the step of sweating the vegetables, and also toasted the spices and lentils lightly in the oil to jar the flavors awake. I’m on a huge mint kick lately, so I stirred in some fresh mint at the end, and finished it with a drizzle of olive oil. My tweaks may not be totally traditional–I’ve never been to Turkey, so I can’t vouch–but I think they make for a more flavorful soup. My favorite element of this is that it’s a little bit interactive–the lemon doesn’t get added until the soup is on the table. Put out a platter of lemon wedges, and everyone squeezes a wedge or two into their bowl of soup. Not only does the juice stay fresh and pungent, but each person can decide how much acidity they want. It makes a pot of soup feel like a family affair. I don’t cook meat all that often. It’s not my favorite thing to eat, and handling raw meat has always struck me as being more hassle than fun. So when I’m in the mood to do something meaty, I like simple, relatively hands-off preparations. Overnight marinades are nice for this kind of cooking–if you plan ahead for it, you can prep in five minutes and then forget about it for a good long while. This particular recipe is inspired by the traditional pre-treatment for fried chicken: an overnight soak in a buttermilk bath. The acid and milk enzymes in the marinade help break down the chicken, making it silky and chin-dribblingly juicy. As it turns out, the chicken doesn’t have to be fried for a buttermilk marinade to work; you can roast the chicken parts instead, adjusting the proportions of sugar and salt in the marinade so that it functions more like a brine. The skin doesn’t get as crisp as it does on unmarinated roast chicken, but the tradeoff is rich, tooth-tender meat that’s so juicy it glistens. Any combination of chicken parts will do–use what you like best. The base marinade is buttermilk, salt, honey, garlic cloves, and black pepper. Just as-is, it’s delicious; the honey adds a light sweet-savory note, and the garlic is there but not pungent. But you can customize it any which way you please. 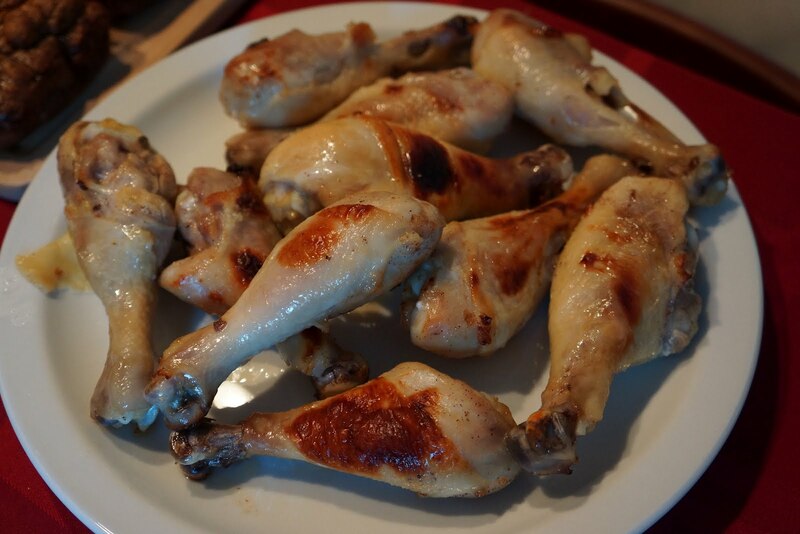 When I made this, my inspiration was medieval–I was brining drumsticks to take to Audrey’s Game of Thrones season finale party–so I added a touch of cinnamon, cloves and nutmeg. It sounds like an odd combination, but I encourage you to try it at least once–the combination of ancient sweet spices and honey might be the best flavor I’ve ever tasted on roast chicken. Having tested this as potential party food, I can say it was a big hit–with one caveat. I wanted something meaty that people could pick up and eat greedily with their hands, like medieval lords. The drumsticks were definitely pick-up-able, but also so juicy that we had to either use plates or stand over the sink. This is not quite finger food–I’d call it plate-fork-and-finger food. Not that that’s a problem. Hair part 2, and an award! Yesterday I went in for a hair modeling session. As I suspected, it was significantly less glamorous than the term “modeling” might imply. There’s a ritzy salon near my office that has an intensive apprenticeship program, and the woman who approached me last week is one of the newest hires. She’s practicing styling different types of hair, and curly hair poses a particular challenge. So, although I signed a photo release, the session was not about modeling the salon’s offerings for the public, but about allowing a new and growing hairstylist to practice her craft on my head. It was a fascinating experience, being the canvas for a craftsman-in-training. The apprentice was clearly nervous, and spent some time debating what style to choose to practice on me. She was supervised the whole time by the salon owner, who stepped in at one point to demonstrate a tweak in technique that made for a smoother curl. As someone who loves–even craves–getting feedback on my work, I was riveted more by their conversation than by what she was actually doing to my hair. And so, for the first time in a long time, when the person handling my hair commented on how thin and fine and soft it was, I didn’t cringe and go dull. I just smiled and nodded and let her go on. As for the hairstyle itself? It was glorious. I looked as if I’d just rolled out of bed that morning with smooth, romantic curls cascading over my shoulders. It was a relaxed, effortless look–and it took three styling products and a solid hour of meticulous blow-drying to achieve. There, I guess, is the rub of hanging my feminine aspirations on my hair: I have neither the time nor the patience (nor, truth be told, the eye-hand coordination) to make myself look so effortlessly polished on a regular basis. So I’ve not been entirely convinced to start showing my hair off more often, but the experience has convinced me that maybe my hair isn’t as freakshow-odd as I’ve convinced myself it is. Under the right circumstances, it can be quite lovely. Last week I was approached to be a hair model. It was the middle of the workday. I was out getting lunch. A young, heavily made-up woman followed me into the curry stand and watched me pick up my food. When I moved outside to the picnic tables, she came up to me. I wasn’t available at 10:15 tomorrow morning. Undeterred, she gave me her card and took down my phone number, saying she’d call me if the need arose in the future. We shook hands, and she walked away, head up, eyeing the women walking by with Blackberries in one hand and shopping bags in the other. As soon as she was out of sight, I let a huge grin split my face. I felt tears pressing against my eyelids. She didn’t know how much she’d just rocked my little world. There is nothing better than a perfectly cooked egg. Nothing. When the yolk quivers as the plate sets down, when you can dig in with the side of a fork and let loose a sticky marigold gush–not runny, not firm, but oozing like syrup–it’s high on my list of my favorite things. 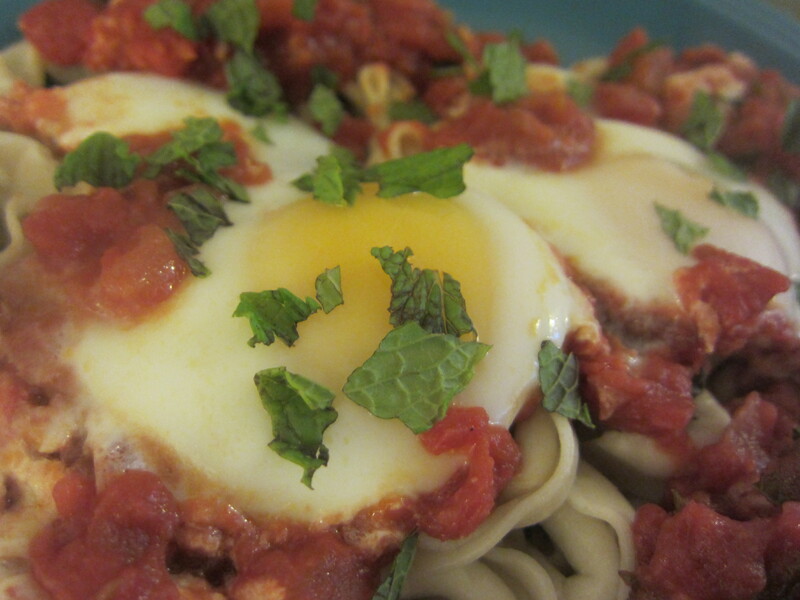 Poach the egg in a fragrant and spicy tomato sauce, and it’s even better. I got the idea from Daisy, who blogged about this a few weeks ago. In form at least, her dish as well as mine resemble the Israeli dish shakshuka: a spicy, jumbled mess of tomatoes and swirled egg whites, with delicate yolk-peaks nestled on top. When you break into them, the richness of the yolks infuses and tames the tart spiciness of the sauce, mellowing the whole dish into something warm and exotic and primally comforting. It’s glorious. My version includes mint, which is an ideal partner for tomato and spice. When I want an easy no-effort dinner, I take some storebought tomato soup and spike it with Sriracha and chopped mint leaves–it impresses people like you wouldn’t believe. In fact, you could very easily grab a bottle of tomato sauce, stir in some hot sauce and mint, poach your eggs in it and call it a day. I’ve included a little more of a recipe here, but it’s still not complicated; the mint is what makes it special. As usual, this is a flexible little dish. I like a smoother sauce, so I left the onion, garlic and jalapeno whole and fished them out; if you want a chunkier sauce, you could dice or mince them and leave them in. You could add cumin or smoked paprika for a smoky backbone, or stir in olives or capers for brininess. You could render some bacon and use the fat to saute the aromatics. You could soft-scramble the eggs in the sauce instead of poaching them. You could crumble fresh feta cheese over the top (note to self: do this next time). And you can serve this over just about anything you like–I used tortellini in the photo, but any other pasta, or rice or couscous or quinoa or crusty toasted bread, would be terrific. It’s peanut butter candy time! 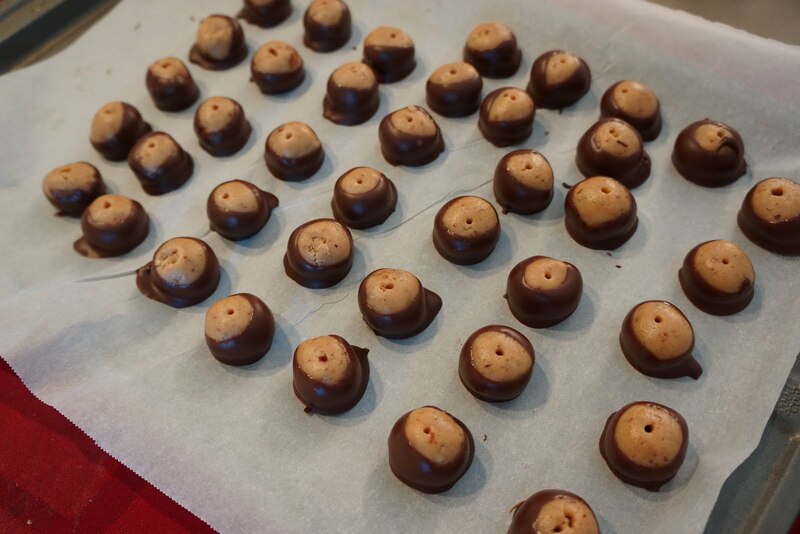 I had never heard of buckeyes until recently, when I decided to make a birthday treat for a peanut-butter-and-chocolate-obsessed friend. The name of the candy comes from the way it’s dipped–a palomino-colored circle of filling peeking out of a dark chocolate shell, making the candy look like a buckeye nut. These might just be my new favorite homemade candy. They involve almost no cooking and come together in a matter of minutes. The flavor and texture are reminiscent of a Reese’s peanut butter cup, with a sandy-smooth filling and a crackling chocolate shell. As a bonus, you can dip them in dark chocolate instead of milk, which gives a much-needed bitter contrast to the sugary filling. The secret ingredient here–the thing that notches it past Reese’s–is a flick of cinnamon in the filling. As far as I’m concerned, peanut butter and cinnamon are basically inseparable. The prickly warmth of the spice is a perfect counterbalance to the nutty richness of the butter. It takes these candies from just good to disappearing-in-10-minutes good. Oh, and about that buckeye look: if you can figure out how to dip these babies without exposing the telltale toothpick hole, you are a better candy-maker than I. With various comings and goings over the past few weeks, I haven’t had much chance to take in the local farmer’s markets. I feel like I’ve been missing a bunch of blink-and-you’ll-miss-it produce. So when I stopped by Trader Joe’s on the way home from work and noticed they were selling fiddlehead ferns–at $4 for a generous half-pound, a relative bargain–it felt like a nudge from the kitchen gods. Cook something seasonal. Try something you’ve never made before. Fiddlehead ferns–so named because they’re shaped like the scroll of a violin–are ultra-seasonal, showing up for about three weeks in the middle of spring. They’re also ultra-expensive–at the Ferry Building, I’ve never seen them for less than $18 a pound. So I’d never bothered to give them a go before. Now that I had a bag of them, I had to figure out what to do with them. On a weeknight, ambitious and overly fussy preparations were out–I needed something simple and filling. So I decided to swap them into my favorite preparation for broccoli or brussels sprouts: sauteed with ribbons of prosciutto and finished with a sprinkling of crispy garlic. It’s the kind of foolproof saute I absolutely adore, because it’s decadent, nutritious and lightning-fast to prepare. 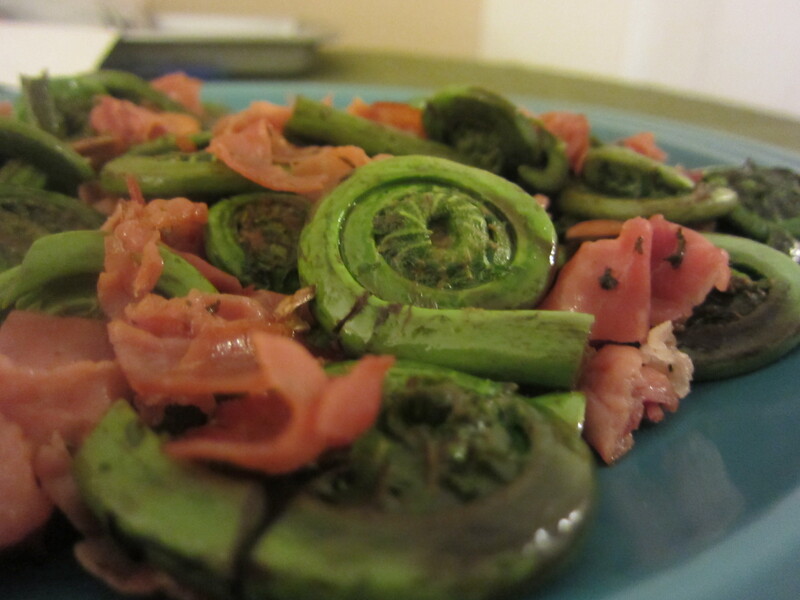 Having now tried fiddlehead ferns for the first time, the best way I can describe their flavor is…green. They taste exactly the way I imagine the color green to taste. I’m not entirely sold on whether that’s a good thing. The texture reminded me of asparagus, which I wasn’t thrilled about; after they were cooked, they developed a briny aftertaste and a mustardy tang, which I wasn’t expecting. Next time I’m not sure I’d use them as a starring vegetable; I might relegate them to the background, as a subtle flavor player and a pretty visual flourish. That said, I can definitely understand the fuss–fiddlehead ferns are romantic-looking, available only briefly each year, and delicately flavored in a way that screams spring. So did I fall head over heels for fiddlehead ferns? No. Will I go out of my way to cook with them again? Probably not. Did they make a perfectly serviceable weeknight dinner, glazed with olive oil and tangled up with crisp prosciutto and golden garlic nuggets? Yes indeedy.